Best Packable Backpack - In-Depth Comparison Guide & Review for 2019! Have you ever gone to the store, or gone shopping, and wished that you had a second bag to help carry all that extra stuff that you bought? Well, that is what a packable backpack is meant to help you with. This is a small and thin backpack that is supposed to be there to help you if you need it but also isn’t too bulky or heavy as to hinder you while you are out and about. So having one of these just tossed in your bag can be a lifesaver if you need any extra space. So, knowing this, what are the best ones, and what makes a good packable bag? What makes a great packable backpack? There are many things that determine whether or not one of these great. One of the main things that you should be looking out for is durability, as well as weight. So along with those two, what else makes a good packable backpack? The material that it is made out of will determine a lot of what is going to be mentioned next. For instance, material determines if a product is going to be durable, if it is going to be lightweight, or if it is going to be water resistant. Nylon and Polyurethane are often chosen for this specific reason, which is why a great or best packable backpack will be made of this material. In fact, all of the ones on this list use Nylon, due to its lightweight nature as well as its durability. However, since it is so thin, it does not get as many of the benefits that it potentially can. 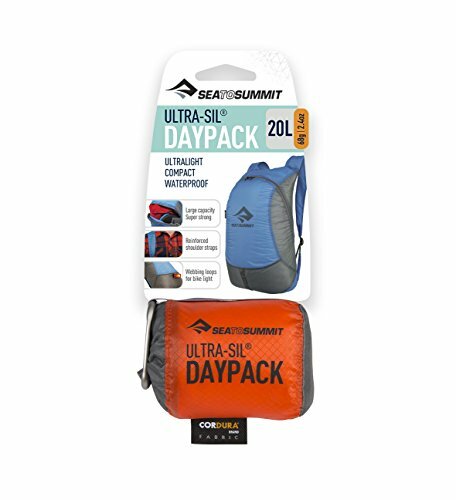 If you are going to bring a packable pack with you when camping or hiking, you want to make sure that it will not add too much to the weight you are already carrying. Because of that, these are often very light and very thin. These are made to be able to fit in your pack. Although, some of them can be small and thin enough to be able to fit in the average pocket. This is known as the compacted size. The unfolded size is important as it shows what the volume of it is, and how much stuff you will be able to carry with it in the case of an emergency. Nylon and Polyurethane are naturally resistant to water. However, that does not mean that they are waterproof, or even able to keep your inner items from getting soaked in a heavy rain. Many packs come with a lining on the inside that is meant to prevent water from coming through. However, this is not always effective. This is why it is water resistant, but certainly not waterproof. In many of the ones that we are going to mention, even easy rain can get through, but that is because of the thinness of the lightweight bag. For many people, color is important. They want something to help match their favorite color, sport, or personal style, so finding one that has the color to suit your needs is good. In terms of design, this can change a lot of things. For instance, a more square design is likely to have a much higher volume than a rounder one. Meaning that it holds a lot more as a result. Design can also male it far easier to harry, and causes less strain on the back of shoulders. Because they are so thin, they are not as durable as we would probably like to have them. However, that does not mean that they will break easily. Nylon or Polyurethane will be able to hold up to large loads, but it is probably best not to use this for very heavy products. In fact, many people have even said that adding in a gallon of milk might in itself be too much. They are also not padded, so a lot of reviewers have recommended against putting anything fragile in them. This one is probably my fave out of all of the ones we are going to talk about because it is both cheap and well made. It has multiple pockets and even has two on the side in case you want to bring some bottles of water or an umbrella with you. This is actually the largest out of all of them, being able to hold up to 35 liters in volume. And despite that, it is able to fold down to the size of a hamburger when you want to add them to your equipment. That means that it can hold 28 of itself inside itself. It is very light as well, weighing only about half a pound. While it is made out of nylon, its durability isn’t the best. However, it does come with a lifetime warranty, so if it breaks, it’s easy to get it replaced. That way you can enjoy it in more than one of its many pastel colors. While this claims to be water resistant, an important feature to find the best packable backpack, many people have complained about is not being such. Some have even claimed that water was able to get through even when it was raining for only a short amount of time. This one is the cheapest pack on this list, which can be seen in its quality, I’m afraid. It is made out of nylon and has 3 zippered compartments, as well as two water bottle pockets. At the very least this provides it with plenty of organization, as it is a small guy that only holds 20 liters. With its small size also comes with the fact that it also folds up into the size of a regular sandwich. That way you can either put it in a pocket or in another bag if you are planning on taking it camping or on vacation. However, its poor durability makes it better for the beach of light travel. 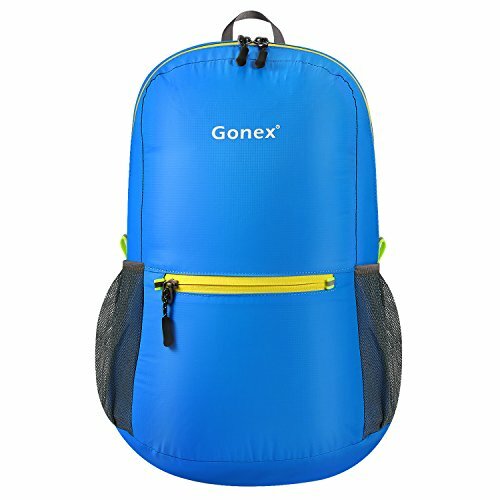 Although Gonex claims that their bag is water resistant, many people have complained that it does not work very well. People have claimed that water is able to soak through even during a light rain, so do not consider this a viable option if you want something to keep your stuff dry. This one is fairly expensive for the size, which is just 20 liters. However, because it is supposed to be an extra sack to have around in case of emergencies, it does its job. This one has reinforced shoulder straps, meaning that out of all of the ones on this list, this has the most comfortable straps. Many do not due to the fact that they are fairly thin, so the straps tend to dig into the shoulders. So there is no need to worry about that too much here. It is fairly durable, made up of nylon and polyurethane, but you still don’t want to add too much stuff inside. This is because it is still not durable enough to be used for carrying heavy books, or groceries, etc. It is water resistant though, so that can help you during a moderate rainfall. When it comes to pockets, you are out of luck with this one, as it only has one main pocket. It does not even have side mesh pockets to hold water bottles. So this one would be bad to use for hiking or camping. Although it has a daisy chain in the front of it that allows for a bike light to be attached. 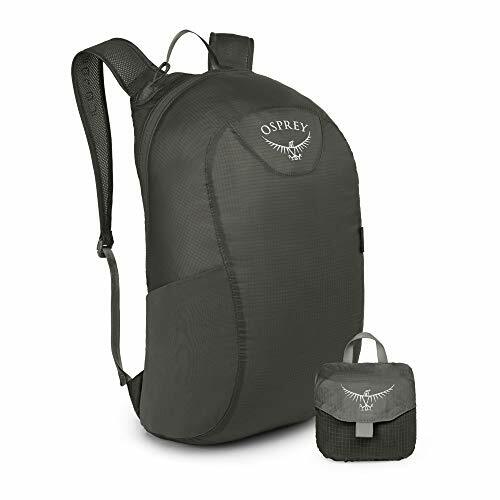 The Osprey Ultralight really suits its name, as it really is the lightest one on this whole list. It only weighs about 3 oz, which is about half of what most of the rest of these weigh. The size is only 18 liters, but what can you expect from something that only weighs 3 oz? Many people like the fact that it is pretty water resistant. It should be able to withstand a moderate rain without it soaking through, but do understand that it is a super thin pack, and is not waterproof. They also come in a few different colors, which is awesome for the fashionable among us. Although this one has a lot more pockets than the last one, it comes with a lot of issues. For instance, the straps are highly uncomfortable, this is because they are incredibly thin and unpadded. People have also complained that the material used is not very durable and tears pretty easily. This nylon bag is able to fit 22 liters in it, which is small, but also not that small. It is also water resistant and weather resistant, making it the best one on the list to bring with you camping. 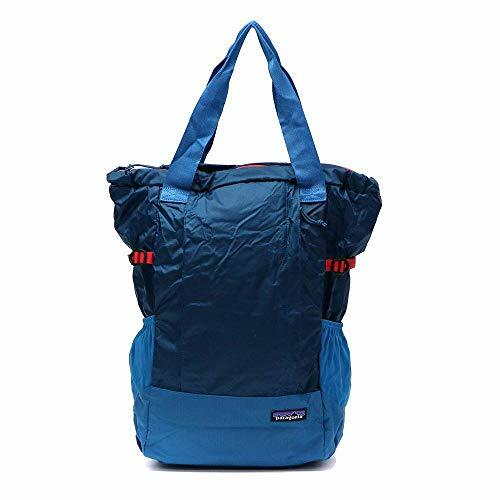 It also has side pockets for holding water bottles or umbrellas, cementing the hiking or camping association. The main good thing about this bag is that it is used as both a backpack as well as a tote bag. It has straps in the back which is able to be detached and hidden so it becomes a simple tote. However, some people have complained that the straps are hard to detach so they are hard to hide. Although this one is probably the best one on the list, it also comes with various downsides. For instance, it is super expensive, going up to 100 dollars for something that is supposed to be an extra. It is also incredibly heavy, weighing almost a full pound. This kind of takes out a lot of the reason to get a spare. Does it include a hydration pack? No. Because these are basically the “spare tire” of backpacks, they do not come with hydration packs. However, if you buy one separately you should be able to add on inside of one of these with little issue. None of them are waterproof, however, all of the ones on this list are indeed water resistant. That way they will be able to provide protection from rain or light wetness, but it certainly will not help you in a heavy storm. However, many of these are not even able to protect from items from light rain, as opposed to what the products themselves claim. So make sure to keep that in mind. They all weigh less than 10 oz, with the exception of one, which is good as an extra or a spare that you are bringing with you camping or hiking. You would not want to carry a full-sized pack with you when walking for miles at a time. Can I put my laptop in it? Also, how big of a laptop can it hold? While you can add a laptop to it, I would highly suggest a fairly small laptop. The bigger the laptop, the heavier it is, and it also makes it less likely to be able to fit. Is it safe to add my iPhone to it? While you can, I would highly suggest that you add your iPhone to your pocket if at all possible. Adding it to any bag increases the likelihood of it getting broken. If you have to add it in, make sure you wrap it in a shirt or something to protect it from the elements. Also, there is no reliably that they will be able to resist water. As a result t is best to not take a chance of your electronics becoming waterlogged. Nobody likes to spend hundreds of dollars to get new tech after all of theirs break, so keep that in mind. Does it have a larger volume for longer trips? 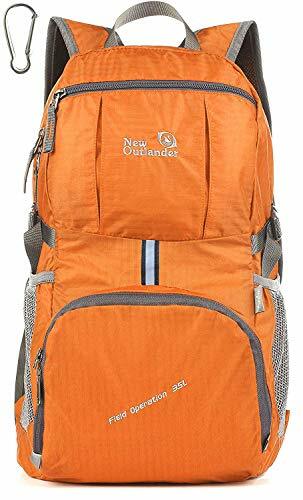 Some of these are larger than others, but I would not rely on this as a sole pack, and simply rely on it as a way to carry any extra stuff that you collect on your trip. As we all generally come back home with more stuff than we left with when we go on vacation. Even with the larger volume, I would highly suggest using light items in them, such as clothing or the like. Heavier items like a laptop or even books are likely to cause them to break. When it comes to ultra-thin and lightweight packs, you are going to have to make a lot of tradeoffs. For instance, durability often suffers because it is not meant to be used for durability. A bookbag, in comparison, is designed to carry heavy books. This isn’t designed to carry anything heavy. All of them have a fairly nice color palate though. This is a nice way to step away from bland black or grey ones, but I know that many people really do not care that much about color. However, if I am going to get one of these, I would like it to be a color that I enjoy looking at. The main issue outside of durability that I saw with pretty much all of these is that they claim to be water resistant, but really aren’t. Many people have complained about pretty much all of these. They claim that even in short or light rain, the water seeped through. In the end, these are good for what they are specifically used for, an emergency pack. Something to put a lot of your extra that you get on your trip that you cannot add to your general bag. However, they are not something I would suggest you use often.